It might not be the most recognized name in the espresso machine industry, but Caffe Cagliari is actually a very old and authentically Italian coffee company. Founded in Modena in 1909, Ambrogio Cagliari first imported tasty Brazilian coffee he had come to known and appreciate during his own stay in South America. He then went on to be one of the very best coffee roasters in all of Italy, and his reputation still precedes the company today. Eventually, they decided their elite level coffee needed a machine to go with it. The Caffe Cagliari Italian Espresso Machine is the result. And a great result it is. 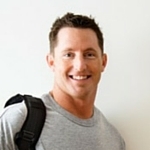 We came across a very cool story displaying the quality of this brand: There is a small lounge located in California that recently purchased one of these machines. You will never guess what happened. Sales in the lounge suddenly rocketed up 30%! We cannot be sure it is a direct effect of the espresso, but we can be sure that everyone seemed to LOVE the hot drinks. 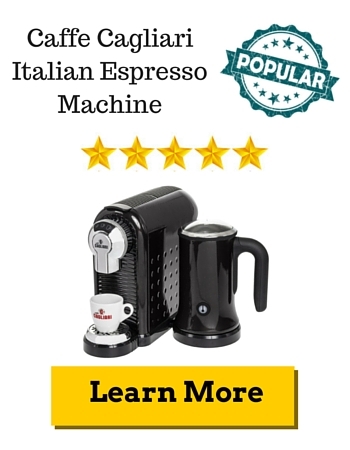 This information was so intriguing we decided to give you our Caffe Cagliari Italian Espresso Machine review. 1 What Makes it Different? Unlike a lot of machines this styling and perfectly sized espresso vessel comes in three different colors. What REALLY makes it stand out is its inclusion of a detachable milk frother, something that normal runs at and extra $80. Yeah, you can be pretty happy about that considering the entire package is only around $200. 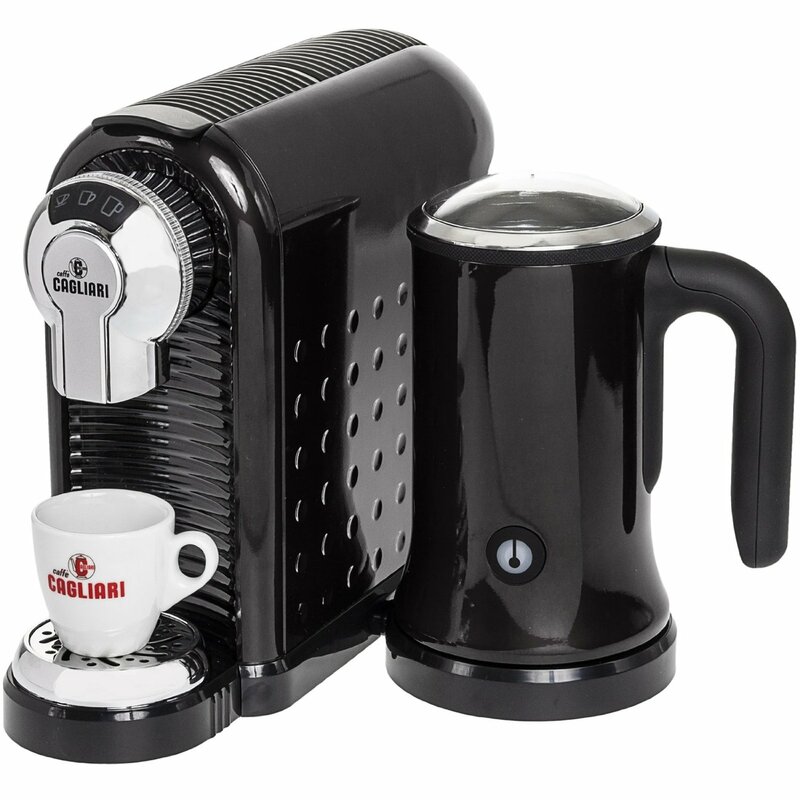 Its price, modern style, and bonus gift will make you feel like you are taking advantage of Caffe Cagliari. Let’s dig a bit deeper into the characteristics of this great machine. Indicator Lights/Buttons: Power switch, cup size buttons, and heating buttons. There is one thing that puts this machine in a spot of its own. The creators recognize your desire for different coffee pods and have made it compatible with most, including Nespresso. So if you want to try some different grounds, they encourage you to find the coffee you love, even if it is not theirs. Be sure to try their own brand of coffee as well though; that little shop in Cali was not wrong about switching to this combination! We are about as eager to try this machine as you are. As a long standing Italian family brand, we have found that Caffe Cagliari enjoys providing simple and tasteful products. They have received 12 different awards to prove so! Their best seller is their coffee product itself so you can be sure they’re going to brew you deliciously hot shots of espresso. There are other machines out there that do similar things. This particular models rival is the Nespresso Pixie Espresso Maker. It is about the same in size and function but you will not find the detachable milk frother with it. If you are looking to take a step up from the coffee pod lifestyle, check out the De’Longhi EC680. At such a great price and the ability to brew competitor’s coffees, this is definitely worth plugging in. It is a perfectly mobile machine that your friends will probably want to borrow. What is their drink? You should probably be kind and invite them over for a steaming, frothy drink sometime. Mmmm, delicious! They will surely be back for more.